A few weekends ago I took a trip to Erdenet, Mongolia’s second-largest city. While there, we did some hiking around and came across a number of ovoos, which is what you see pictured below. While I don’t know a lot about ovoos, I do know that they are a part of shamanism, the belief system that has traditionally been most prevalent in Mongolia. While I don’t know much about shamanism in Mongolia or the deeper meaning behind the ovoo, for me, ovoos symbolize what I find most alluring about Mongolia: the ancientness, vastness, and uniqueness of this land. A land in which you never know when you might come across a beautiful, mysterious rock pile which has marked a sacred space for an unknowable number of years, decades, or maybe centuries. The North Star Project 2013-2014 School Year Reports: The Middle Ground Journal’s collaborative outreach program with K-12 classes around the world. We gratefully acknowledge North Star Academy of Duluth, Minnesota as our inaugural partner school, and the flagship of our K-12 outreach program. We also warmly welcome Duluth East High School and Dodge Middle School to our collaborative program. Does the ovoo being placed in particularly high places have something to do with the correlation that it is “reaching up to the sky?” Similar to most other religions in which symbols or practices correlate with the heavens. This just shows that religious beliefs may be different, but at the same time, some of them have similar components. The idea in this article that strikes accord with me is how as human beings we like to leave our mark on the world. Also how as humans we wish to mark important areas. I know in my area whenever there is a car crash the scene is memorialized by others in the community. The most recent accident in our area now has a wooden cross in the ditch to mark that place. It’s one of those world wide themes that people can study is how humans leave their mark, and where they leave it. What was your original purpose in your travels to Mongolia? Did you also circle the ovoo and if so, why? Was their any spiritual benefit to you? I feel like if I were to encounter such a thing, knowing what I know now, I would want to participate in the ritual, even if it does not directly relate to my faith. I think that something that is holy to anyone, should be respected by all cultures. I see no harm in practicing multiple religions, even if just for a moment. I really like Tayler’s comment about participating in the ritual even if it is not part of a persons faith. I would do the same thing as I believe that having and showing respect for what others hold as sacred is an act of holiness. Thank you for sharing your discovery of the Ovoo. It is very interesting. I don’t find it very surprising that such a sacred place or thing is located on top of a hill, mountain, or any high place. Throughout history sacred places have been located in high places. I would think it symbolizes power and strength, like the author said it is always growing so if you look at the top of a hill and this structure is growing, I would think that you would find faith in the ever growing structure on top of the hill. I, too, find it interesting so many religious sites are on higher ground. When a hill or mountain top is unavailable, places of worship build their structures tall to produce the same symbolism Kristen Olsen mentioned in a previous comment. In some cases, churches in Europe would compete for tallest steeple. I like the symbolism or idea that the ovoo is ever growing and adding to the height of the mountain. I would have liked to learn more about the symbolism behind this action because it seems very interesting. Shamanism is my religion and this is really interesting to read about! I don’t have any knowledge about the practice but I assume it’s a different practice done within a different ethnic group. Thank you for sharing your story and hopefully you had a great time to Mongolia! I don’t know much about Mongolia, but this article is quite interesting. I don’t know too much about Shamanism but from what i have heard it is a unique religion. It’s interesting that they have so many symbols for object. Great article! This was very interesting to read about since we don’t really have these in the U.S. I think this would be really cool to see in person because of all the history behind the rock pile. I wonder what would be comparable to this tradition here in America? It was very cool to read about all these things and realized how we don’t have any of these in the U.S. I think the history behind this is very cool! this tradition is very cool and should continue. Different traditions and rituals like this exist all around the world. They are some of the things that allow people to be connected in ways they could not have otherwise. 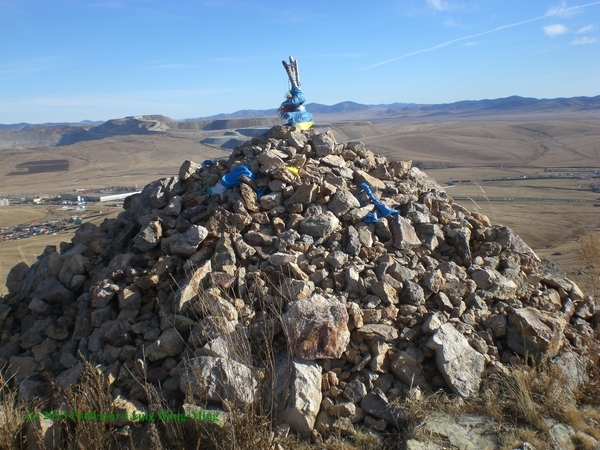 The ovoo is a scared cairn in the Mongolian Shamanic traditions that stands on remote mountain tops and the like as a pillar to the religion to anybody that might come across it. I think the part you wrote about people having to circle it clockwise three times and add on a rock when they pass is pretty neat because it gives the people within that religion and some that that do not practice it as well a sense of being a part of something that has been around for a long time.